If you’ve been reading the blog for a while, you may have noticed that I have a thing for poke cakes. 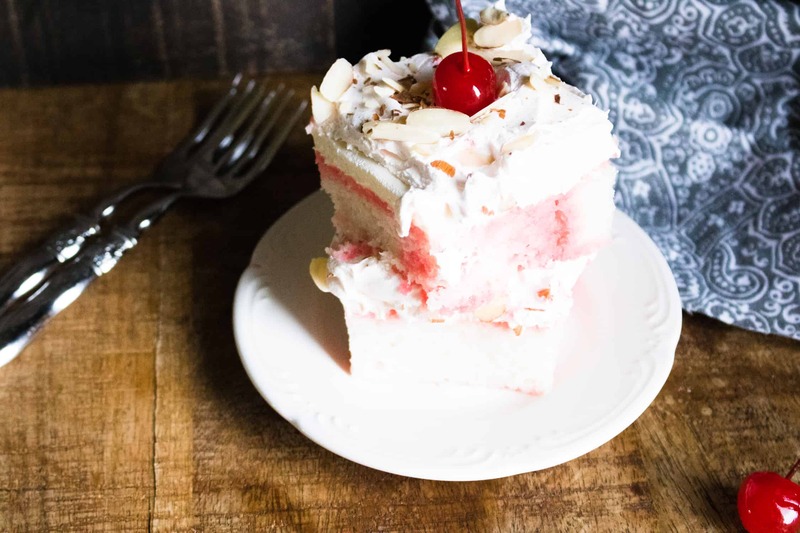 This Cherry Almond Poke Cake saturates a white cake with cherry syrup to really pack in the cherry flavor. 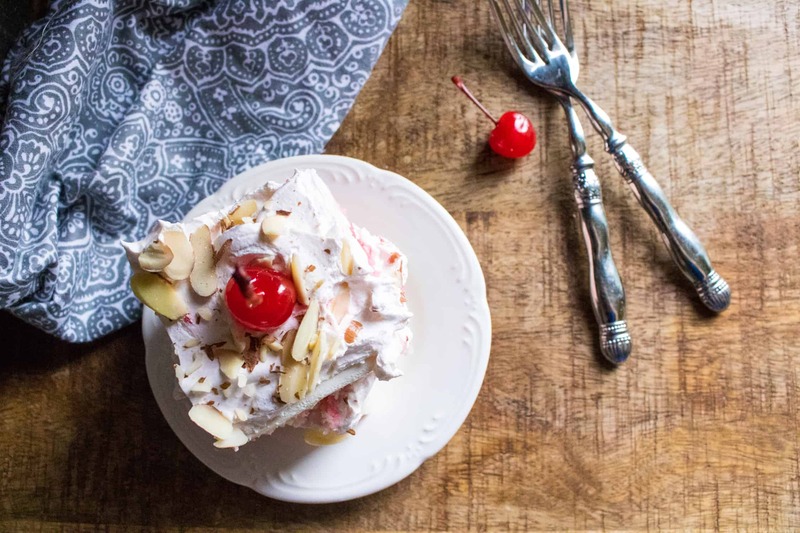 And, cream cheese almond topping really brings together the traditional pairing of cherry and almond. 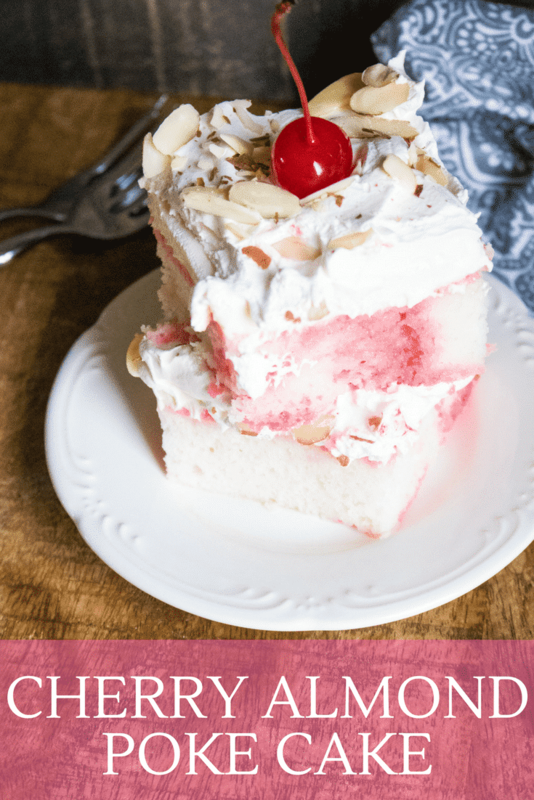 WHY DOES ALMOND GO SO WELL WITH CHERRY? Almond extract is a great addition to cherry desserts because it balances the acidity of cherries. You may not have realized it, but most cherry desserts include almond for this reason. 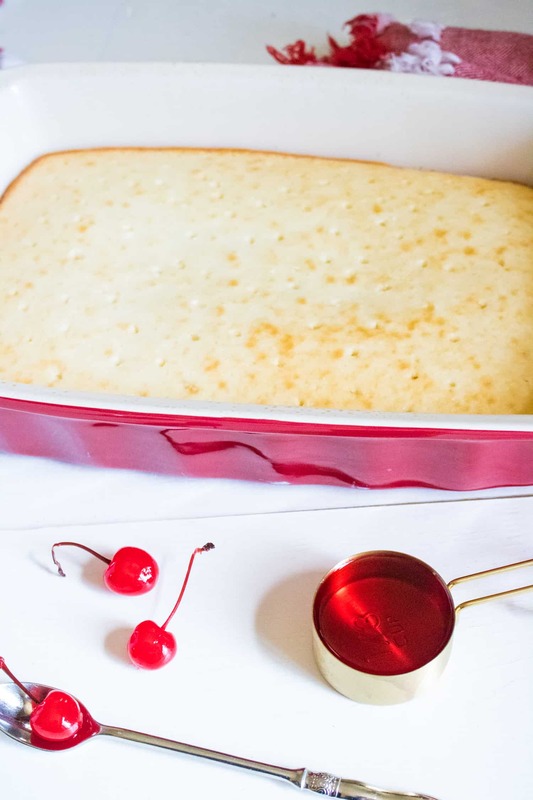 This Cherry Almond Poke Cake uses maraschino cherries and cherry syrup. Maraschino cherries are the bright red cherries you often see in Tropical Fruity Sangria, on top of ice cream sundaes, or in a pineapple upside down cake. Their bright glossy red color is iconic and has been a stable in American cocktails and desserts for decades. HOW ARE MARASCHINO CHERRIES MADE? Maraschino cherries were introduced in the U.S. in the late 19th Century. Cherries have a short growing season and were hard to produce, so food companies started to preserve them in a brine solution. The cherries were then sweetened and colored the ruby red color that has made them famous. WHY THE OBSESSION WITH POKE CAKES? Poke cakes are a great way to infuse cake with flavors and moisture. By poking little (or sometimes big) holes in your cake, you can let the flavor of your choice seep into every bite. 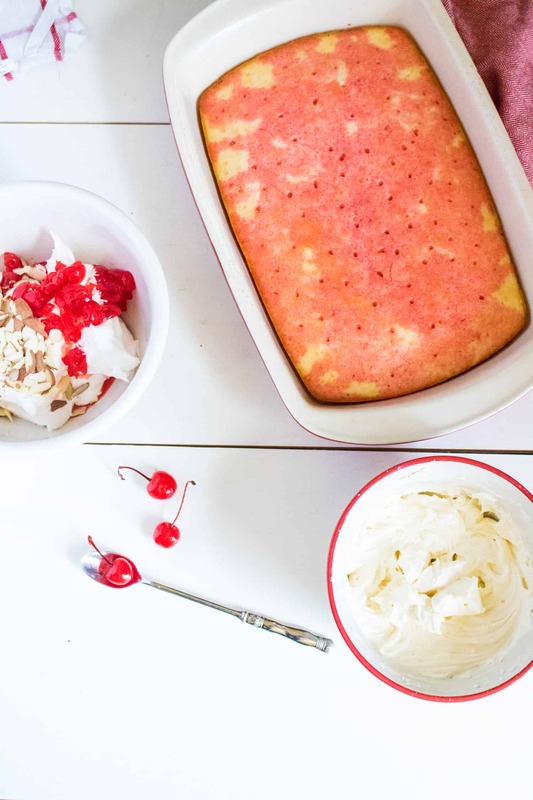 This moist and flavorful Cherry Almond Poke Cake will give you a taste of summer in every bite. Check out the links at the bottom of this post for more delicious poke cake recipes. Bake cake according to package instructions. Allow to partially cool on a wire rack. Once partially cooled, poke holes with a fork or wooden skewer. 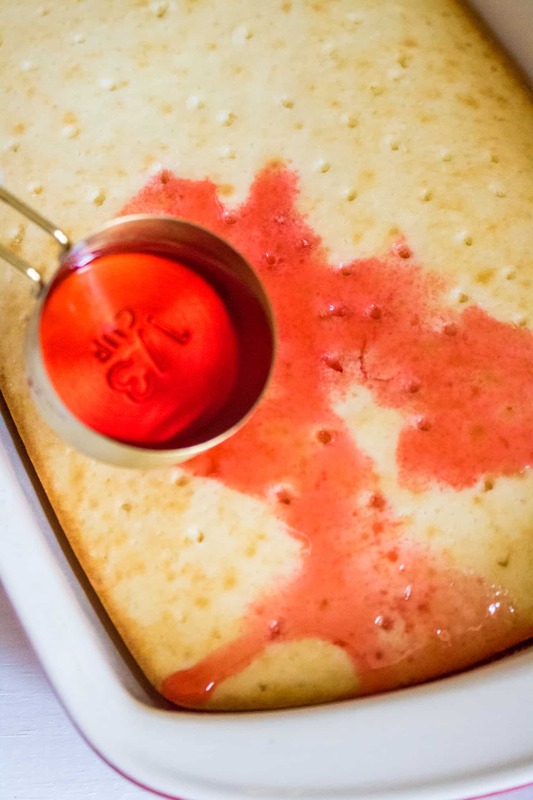 Pour cherry syrup over the holes in the cake, allowing the cherry syrup to soak in. Cream together the cream cheese and powdered sugar using a hand-held mixer. Add in almond extract and almond milk. Spread cream cheese mixture over the top of the cake. 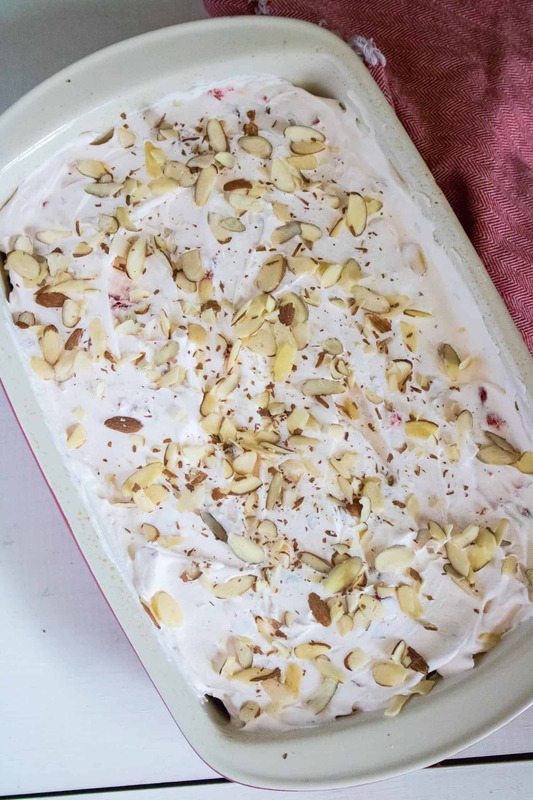 Mix together whipped topping with cherries and half of the almonds. Spread this on top of the cream cheese mixture. Top with remaining almonds. Refrigerate for at least an hour prior to serving. Slice and serve with an extra cherry on top. Bake cake according to package instructions. Allow to partially cool on a wire rack. Poke holes with a fork or wooden skewer. Pour cherry syrup over the holes in the cake, allowing the cherry syrup to soak up. Cream together the cream cheese and powdered sugar using a hand-held mixer. Add in almond extract and almond milk. Spread cream cheese mixture over the top of the cake. Mix together whipped topping with cherries and half of the almonds. Spread this on top of the cream cheese mixture. Refrigerate for at least an hour prior to serving.